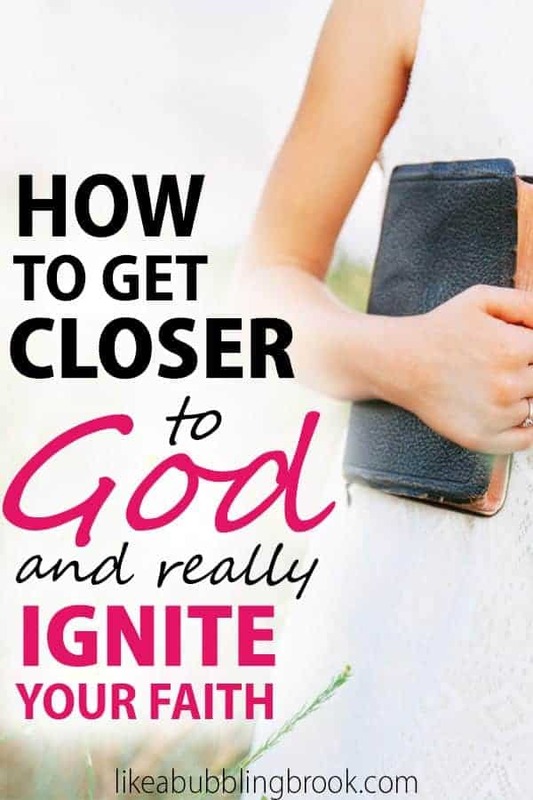 Have you wondered how to get closer to God, but didn’t know who to talk to or where to turn? As a pastor’s wife, I often hear from women who ask that same question. Here’s my answer, outlined as a simple, 5-point action plan for spiritual growth as a new believer. I pray it ignites your faith and deepens your relationship with God! Yes, I’m talking about prayer. Prayer is simply talking to God! Talk to Him like you would a friend or family member; you don’t need to use rehearsed prayers or memorized prayers. Thank Him for tugging at your heart and giving you the desire to even seek out such things as “how to get closer to God.” Pray that His Spirit would guide you in prayer and give you the words to pray. But, the goal is to learn how to talk to the Lord in your own voice, using your own words, and not to always rely on reading a prayer. He wants to hear from you! Think of the Bible as His love letter to you. I recommend beginning with the New Testament, either Matthew or James. As you read, prayerfully ask God to bring you revelation through His Spirit. Reading the Bible was never intended to be an intellectual endeavor, it was intended to help us transform into His image and draw closer to Him. The only way that we can receive revelation and transformation is through His Spirit working in our life. We need God’s Spirit to illuminate His Word and open our understanding! Having His Spirit operating in our life and illuminating what we read in the Bible is one important way how to get closer to God. Romans 12:2 says “do not conform to the pattern of this world,” and then it also tells us “be transformed by the renewing of your mind.” How can we renew our mind so that it aligns with what God has for us? One of ways is by coming to church and listening to biblical preaching and teaching. 1 Corinthians 1:21 tells us God uses preaching “to save those who believe,” but it’s made even more clear in the book of Ephesians. Ephesians 4:11-12 says, “And He Himself gave some to be apostles, some prophets, some evangelists, and some pastors and teachers, for the equipping of the saints…” (emphasis mine). Did you catch that? Learning from our pastors and ministers are one of the ways we are equipped to grow and serve! Going to church and listening to the preached Word of God is one of the ways how to get closer to God. If you need help finding a good, biblically sound church in your area, where the Spirit of God is moving and working among the people, reach out to me with your city/state and I’ll be glad to help you find one. 4) Prayerfully seek out godly mentors. If you haven’t had a godly older woman come alongside you and teach you these things, don’t give up hope. Rather, keep a teachable spirit. Seek out mentors from a distance during this time, by way of blogs like the one you’re reading now, good books, videos, and bible studies. Desire to learn and walk in the fullness of God’s purpose for your life. While you’re waiting, learn to walk in God’s ways, rather than walking in your own way. Search God’s Word while you actively seek out godly older women to speak into your life. 5) Begin learning how to study the Bible. Don’t worry about fancy Bible study methods at this point in time, just begin to write out your thoughts about what you are reading. What is God showing you in His Word? 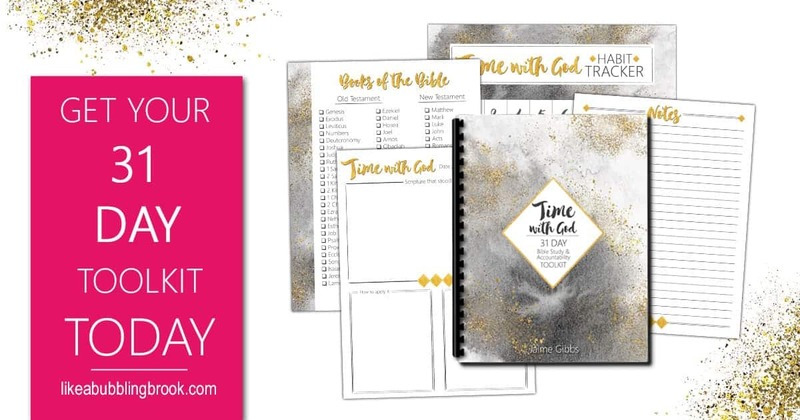 You can use a simple spiral notebook, or download my 31-Day Time With God Accountability Toolkit. Write that day’s passage, what stood out to you, ideas for applying it to your life, and more. You can even do this as a family, with your spouse and/or children. Each of you can keep a separate toolkit and write your own thoughts, but discuss and share ideas together. If your child isn’t keen on writing, they can draw pictures instead. Cross off each day when you’re done. It’s a powerful way to stay accountable to your quiet time with God! God loves you so much! Don’t get discouraged. He desires that you grow closer to Him and He will help you if you continue to prayerfully seek Him! If you’re craving more from your time with God, you’ll love my 31-Day Time With God Toolkit. It’s a simple way to get closer to Him each day! Do you crave more from your time with God? Instead of feeling lost and like you don’t know where to begin, you can feel like you have a game plan and an outline for time with God each day. You can write out daily bible verses — and your prayers — as you have a few minutes here and there, then come back to it later. There’s also a habit tracker so you can mark your progress each day. Sometimes it feels good knowing you’ve accomplished something when everything else seems to be a constant struggle! Click here to learn more about the Time With God Toolkit. this site are apostolic. I will paste the link below.